Who wouldn’t love a dock be it small, large or a complex one with a lot of design innovation? A dock brings you closer to the nature and life around you and sets your building apart in design and style. Today we will consider what it takes to build a dock and what steps you have to keep in mind when constructing your dock. Floating Dock: this type of dock is anchored to your shoreline, and it is supported by floating units also called pontoons. This type of dock is one of the popular or versatile with dock lovers. This is due to the easiness to buy the materials, install it, configure it, and in a nutshell, get it constructed. The floating dock comes in handy due to the flexible nature that allows you to remove and reconstruct it. However, the floating dock has its draw backs. One of this is the lack of stability which is a crucial feature of it. A lot of people got uncomfortable and scared at the idea of walking on a floating dock because its movement is dependent on the waves and footstep. This isn’t the definition of stability though it is not tippy. Crib Docks are docks that are designed and built by expert dock builders or professionals. They are the most permanent and expensive kind of docks to construct. The crib dock has a part referred to as the ‘crib’ which is responsible for providing the support that holds the dock to the bottom of the lake. The method of construction of a pier primarily fits cribs that are similar to crates. The creation of cribs requires using mostly treated timbers that are placed with repeated spacing in the lake and filled with rocks. These cribs serve as a permanent anchor for the dock upper structure and walkways. Crib docks provide the most integrity and strength. They are unlike floating docks not design to be moved or removed from the water. Post Docks: another type of dock is the post dock which uses leg support assemblies placed about 10-feet along the pier to support it. The feet of the leg support sits directly on the lake bottom which makes the dock semi-permanent. The post dock is very popular, and they provide a sense of stability floating docks do not have. They are easy to remove and install. This takes a couple of hours making it ideal for freezing climate damage to dock’s leg by ice is possible. Let’s get to the construction of Docks. To build or construct a dock, you need to know your materials, understand local weather and have a design and layout of how your dock should be. Let us consider each of these. Most DIY docks are constructed based on plans that have been purchased. These kinds of docks are built the old fashioned way and need materials like treated wood, galvanized screws, nuts and bolts. Some other materials like aluminium and plastic kits for decking material are mostly offered by suppliers today. Using the right materials provide durability, strength and weather resistance which is very necessary for a long-lasting dock. Woods require more maintenance which means time, unlike aluminium and plastic docks. The removal of a wooden pier is a near impossible task except with the aid of structures like a wheel system. Other hardware like screws and bots can be galvanized. When building with wood, these come in a lot handy. Three types of design layout exist for docks. These are T-Dock, L-Dock, U-Dock and Y-Dock. Dock designs are dependent on the configuration of Lake Bottom as well as local restrictions and regulations. When planning to build a new dock or expand an existing one, it is essential to know what is applicable is your locality. When designing, take into account, the shoreline and the kind of boats that will be available on your dock. You need to take into account the wind direction as well. L or T shaped extensions protect buffeting winds, and they add stability to your dock. Weather Worries: when building your dock, it is essential to consider the weather or climate over that region. For example, if you plan to make your dock in freezing climates, it is necessary that you have a plan to keep your dock alive with the ice. You may choose to bubble or go with removal of your dock; this depends on how your dock is constructed and with what materials. 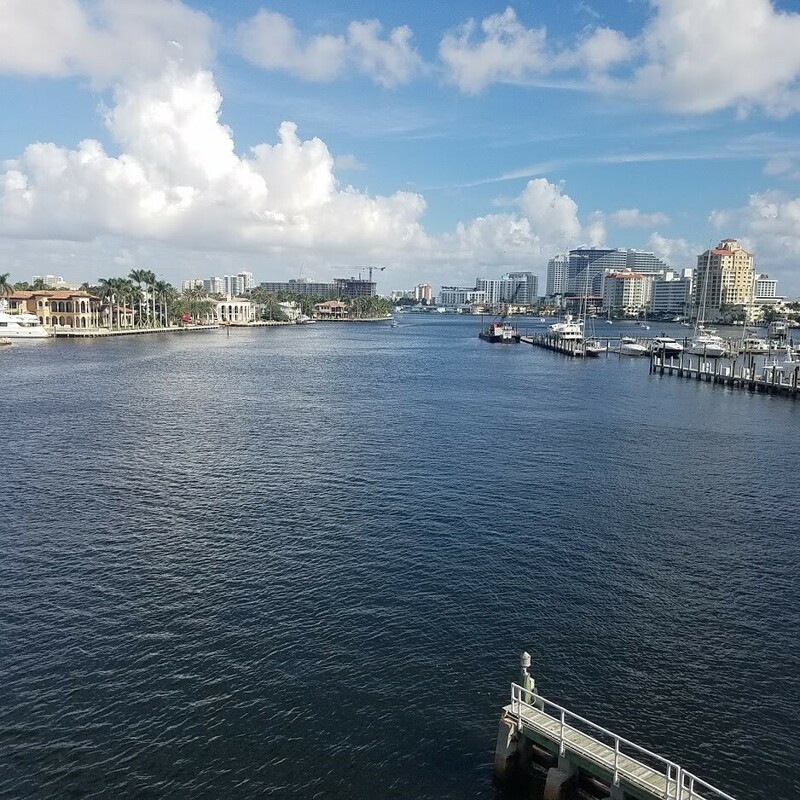 Fort Lauderdale waterfront on the Intracoastal. Be honest about your budget: on a regular basis, docks take a couple of thousands of dollars to construct and may go even higher when one is trying to get a complex construction done. It is better to know what you are against and get prepared for it. Even if you decide to design your dock yourself, you may consider the fact that more time and resources will be spent in getting your dock in shape as against hiring a professional to handle the job. So, consider your budget and go for what it can hold. Having a dock is one way to enjoy life and getting yours done locally is a great thing as these providers will be there for you along the way!